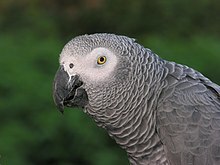 Ar peroked gris Afrika (liester perokeded gris Afrika) a zo ur spesad perokeded, Psittacus erithacus an anv skiantel anezhañ. Geotdebrer eo ar spesad dreist-holl ha bevañ a ra diwar vleuñv, delioù, frouezh, kraoñ ha rusk ; degouezhout a ra dezhañ debriñ amprevaned ivez. Kavout a reer ar spesad en Afrika, en un takad hag a ya eus gevred Aod an Olifant da gKenya, Tanzania hag Angola, hag inizi Pleg-mor Ginea. (en) Psittacus erithacus war al lec'hienn BirdLife International. (en) Psittacus erithacus war lec'hienn an International Union for Conservation of Nature (IUCN). ↑ Roadennoù IOC World Bird List diwar-benn Psittacus erithacus (lennet e-barzh d'ar 25 a viz C'hwevrer 2016). Kemmoù diwezhañ degaset d'ar bajenn-mañ d'an 21 Gwe 2016, da 10:36.